The human eye can only see a limited range of the spectrum, whereas satellites can register visible, infrared and a large range of other wavelengths. Remote sensing means measuring an object at a distance without physical contact with it. Eyesight is a form of remote sensing. When the eye sees an object, the electromagnetic radiation (reflected light) from the surface of the object is registered. The radiation contains information about the surface and we see colour and form. A scanner in a satellite also records electromagnetic radiation. A white surface reflects equal amounts of radiation of all wavelengths of visible light, whereas a green leaf reflects less radiation in the red and blue parts of the visible spectrum than in the green. This gives an excess of green light (compared to red and blue) and the leaf looks green. So the composition of the electromagnetic reflection, the spectral signature, tells us about the surface emitting or reflecting the radiation. The ability of satellites to distinguish between various spectral signatures is critical for their use in mapping, where the distinction between different surface and area types is essential. The human eye can only perceive radiation within a limited range of the electromagnetic spectrum. So instruments for remote sensing outside the visible wavelengths actually represent an extension of our visual field and they give access to additional information about the physical world surrounding us. Electromagnetic radiation from a surface is either a reflection (reflected light) or an emission (radiation emitted from the surface itself). 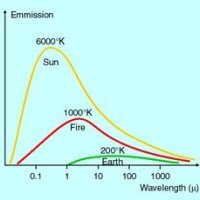 Reflected sunlight is for obvious reasons only measurable in daylight, whereas emission can be measured at all times. Thermodynamics indicates that a body at a temperature different from 0 Kelvin, i.e. an object on Earth, emits radiation proportionally to its temperature. Surface temperature is a key factor for emission. The Sun has a surface temperature of 6000 degrees kelvin (K) and a maximum emission in the visible light range. A surface with a temperature of about 1000K, e.g. a fire in the Amazon, has its maximum emission in the middle infrared spectrum. The surface temperature of the Earth is about 290K, with a maximum emission of around 14 micrometres. This is also called the thermal infrared range (see illustration). There is a direct correlation between surface temperature and degree of emission at a given wavelength. The surface temperature can therefore be calculated on the basis of remote sensing of the thermal infrared emission. Surfaces with different temperatures have maximum emission at different wavelengths. The maximum emission of the Sun is in the wavelength of 0.483 micrometres, whereas that of the Earth is at 14 micrometres. Emission from a surface is a function of its surface temperature, which means that surface temperature can be calculated on the basis of remote sensing of surface emission. As the Earth only radiates small amounts of energy in visible light, it can only be seen because it reflects visible light from the Sun. Sunrays hitting the Earth can either be absorbed and thus contribute to the heating of the Earth or be reflected and seen by the human eye or sensed by a satellite. The albedo value of a surface indicates how large a percentage of the sunlight is reflected.